My breed was developed through selective breeding of the Tweed Water Spaniel, smaller specimens of Newfoundland and various setters. I have always had a very good reputation as a versatile and reliable hunting companion, but you might not know that I have other talents as well. Guide dog training instructors sing my praises, and I also do extremely well in obedience competition. I make an outstanding family pet because I am in tune with people and very patient with children. I do need lots of outdoor exercise to stay fit and healthy, though, so it is best for me to live in the country unless you can provide a place for me to run and get some sunshine. When fully grown, I am between 21 and 24 inches tall (53.3 to 61 centimeters) and I weigh between 60 and 75 pounds (27 to 33.8 kilograms). 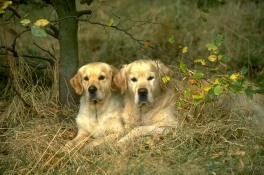 We have no Golden Retriever Breeders listed at this time. Click here to place your Golden Retriever Ad!